I’m writing this at 4am because I woke up and can’t fall back asleep. I wouldn’t expect myself to fall back asleep though—I went to bed last night at like 7:30pm. Is this adulthood? Haha. I was watching the Kansas basketball game with Trevor and fell asleep on the couch. So now here we are, at 4am, writing a blog post, and just staying awake before I have to go to work. I wanted to write this post today about Lang Videography. For those of you who may be unaware, I started a videography business earlier this year. We’ve booked a a good number of wedding events so far, and it’s been a great learning experience. I’m really excited for the future of Lang Videography, so I wanted to share some of my work here. I’ve been creating videos of differing styles for over 5 years. Vlogging, sit down, montages, etc. From quirky and literally LOLing, to romantic and slow-mo worthy, I am constantly learning about the best way to capture any moment. With Lang Videography, my job is to contain the essence of who the customer is and bottle it into a video that can last a lifetime. The videos that I create have always been as a means to hold a moment in time--something you can review for years and years to come. I love keeping my own memories in video form. This is why we vlog. So when I started Lang Videography I knew I wanted to keep my same storytelling background in mind while shooting these cinematic wedding clips. I constantly think about the memory that I want to capture for the couple and the feelings that I want them to experience again. I think that this is what sets us apart from other videographers. There are three parts that make a wedding video a perfect story telling masterpiece—great visuals, music that makes you feel, and crisp audio that reminds you of the day. While we have adequate visuals relevant to our current cost, we are still working on making them better (cameras are expensive, ya’ll, but I have an upgrade in mind for very soon!) I think I’ve mastered the music portion of this wedding video creation triangle because I have access to a music library that has songs that have gone perfectly with every wedding video I’ve filmed. But the final thing that we need to work on to really set us above and beyond is great audio. I love when we get a chance to use audio to actually tell a story! At this moment, we don’t have designated audio gear for using at weddings; however, this is a goal of mine that I’d like to get to some day. That being said, sometimes the audio is still captured really nicely via our cameras, and I can use it in the final video as one more piece to the puzzle that just really tells the story of the bride and groom. These two videos below have snippets of audio (other than just music in the background), and that’s why they’re some of my favorites. In comparison to other wedding videographers, we are VERY reasonably priced. This is because I am still learning and still trying to get better gear and equipment. I never want to charge our customers a high price for the sake of keeping up with current markets—I charge what I think is fair and equal to our customers based on the product we produce and the time it takes for us to produce it. I’m currently booking weddings in both Indiana and Kansas. Since we live in Kansas as of today, we market all of our different packages here; however, for our Indiana friends we ask in most cases that you book the All Day package as a requirement, but the travel cost will be waived! If you’re interested in having us film a special day for you, please feel free to head on over to our website to browse some of our options and fill out a contact form. I'm not formally trained in video, but I really like it. I don't have the best gear, but I'm working towards it. I know I'm not the best, but every day I'm learning more. If you'd like me to assist you with literally ANYTHING videography, editing, etc. related please do not hesitate to reach out. I need all of the opportunities and experience I can get. My friends and family are who will help me grow! This video above is another one of my favorites (basically all of my videos I’ve created so far are my favorites, haha). But the reason I wanted to share this video is because these two amazing people are also videographers. 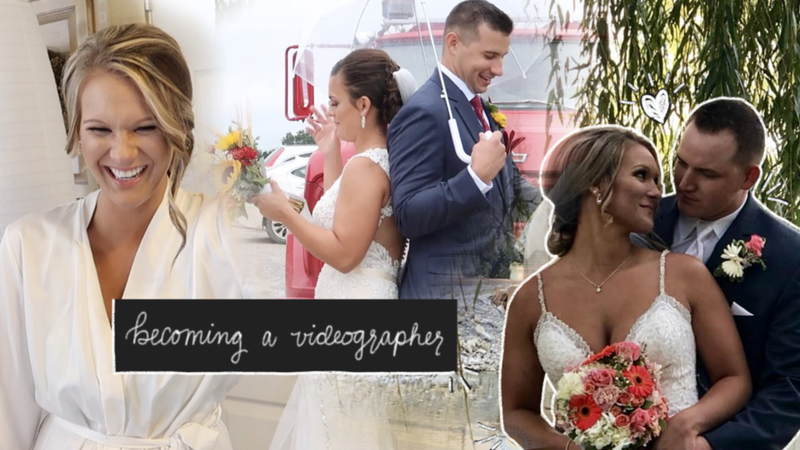 They reached out to me in order to have us film their wedding and we decided to do a trade of services—I filmed their wedding, they filmed mine! It was the perfect work around for us both. So, that being said, I wanted to let any future customers know that this is the type of learning and growing experience that I need. If you have a negotiation in mind in which we can both work together to get an outcome that we both need, then please contact me because I would love to help. I’m truly having a blast filming weddings, but I am very interested in filming anything and everything that anyone might need. I’m excited about the possibilities that being a videographer could hold. And I’m pumped to be constantly learning more, getting better equipment, and capturing important memories for anyone who needs it.